As is well-known by now, in late October 2016, Donald Trump’s personal attorney Michael Cohen paid adult star Stormy Daniels $130,000 in order to purchase her silence about an alleged affair a decade earlier. The exact set of facts around this payment remains shrouded in mystery, with Cohen maintaining that he made the payment alone, without Trump’s knowledge, and with personal funds. However, sharp-eyed observers have noted that, in late October 2016, the Trump campaign made a series of five large payments to Trump-affiliated entities, totaling $129,999.72. Campaign records do not provide enough information to conclusively determine, through traditional methods, if these payments are related to the Daniels payoff. Some journalistic observers have dismissed them as irrelevant, evidently believing the close match to be a coincidence. The suspicious payments in question were first identified by Susan Simpson, a DC-based attorney and blogger. Examining Trump’s FEC filings, Simpson identified five disbursements from the Trump campaign to Trump business entities, totaling $129,999.72. The values of the payments ranged from $8,554 to $79,043.94, which placed them on the larger end of the spectrum of Trump-to-Trump transfers reported to the FEC. Moreover, none of the suspicious payments appeared to be regularly scheduled rent payments. The timing was particularly suspect. The final of the five payments was on Oct. 25, one day before Michael Cohen was notified by his bank that $130,000 was in his account, ready to be transferred to Daniels. If it could be shown that these transfers were related to the Daniels payoff, it would represent a major development in this story. First, it would conclusively demonstrate the link between the Trump presidential campaign and Daniels situation, potentially raising campaign finance liability for Trump. Second, and perhaps more importantly, falsified campaign records could create liability for Trump beyond the realm of campaign finance, and possibly extending into the vicinity of criminal fraud. While Simpson has identified several suspicious qualities about these payments (e.g., unlike other payments, they cannot be clearly correlated with known campaign events), campaign finance records are notoriously ambiguous. Thus, it may not be possible, examining the payments on an individual basis, to determine if they are legitimate or falsified. To explore whether these payments are worth investigating further, we have approached the question from another angle. Instead of examining the individual payments forensically, we have instead focused on the rather close match between the summed payments ($129,999.72) and the $130,000 Daniels payoff. It struck us as fairly unlikely that, by chance alone, so few payments would sum to such a precise figure. In order to investigate these suspicions, we developed 10,000 sets of simulated Trump campaign payments. Each set contained 10 randomly generated payments. We then searched each of those sets for the combination of payments with the total closest to $130,000. The simulation confirmed that it is extremely unlikely that, by random chance alone, a set of payments near a specific date would almost equal $130,000. For each of the 10,000 sets, we generated a “closeness” value — the difference between their “best match” and $130,000. For instance, if the “best match” was $130,014.29, the “closeness” value would be $14.29. Across 10,000 sets of simulated payments, the 99.9th percentile of closeness was $0.24. The actual degree of closeness in the real-life Trump campaign finance records is $0.28. In other words, out of every one thousand simulated payment sets, only one contained a combination of payments as close to $130,000 as the real-life payments made in the week preceding Oct. 25th. 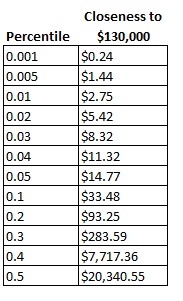 The degree of closeness at various percentile cutoffs is expressed in the table below. As the table suggests, even a match within a few dollars of $130,000, much less a few cents, would appear to be very unlikely. We also developed a somewhat more conservative version of the model, which produced similar but slightly less robust results. It is discussed below. It is worth taking a moment to note one unusual implication of these findings. In order to generate our simulated sets of payments, we relied on a list of all Trump campaign payments to Trump-affiliated entities, compiled from FEC reports by Simpson (available here). The list was used to ensure that our random payments shared the approximate distribution of the Trump campaign’s actual payments to Trump -affiliated entities. In all, we generated 10,000 sets of fictitious payments, with each set containing 10 total payments. The set size was chosen for several reasons. As the set size increases, the number of possible combinations reaches into the tens of thousands. In addition to being computationally intensive, it is implausible that an individual could easily identify a suspicious combination over such a large set. As it stands, a set size of ten allows for approximately 1,000 different combinations. Moreover, the actual suspicious combination was discovered in the set of eight payments immediately preceding the Daniels payoff. A set size of ten roughly estimates the probability of this discovery, while allowing that Simpson or others may have continued to search a bit further back if current combination had not been discovered. Notably, our model includes no time element. This is because time is partially expressed by the number of payments in each set. The greater that number, the “further back” the model is simulating. 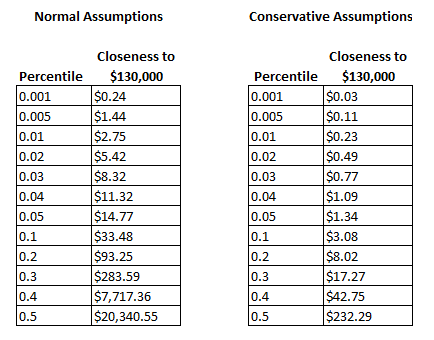 To ensure that slightly altering our assumptions would not dramatically change these findings, we also tested a slightly more conservative model, in which 10,000 sets of 15 payments were examined. To keep the model computationally feasible, we restricted the output to the closest combination of six payments generated by each set. In this model, the actual observed combination of $129,999.72 falls somewhere between the 98th and 99th percentile of closeness. In other words, while the observed outcome is considerably more likely under these very generous assumptions than under the normal assumptions, it is still quite unlikely overall. The output of both models are in the tables below. We also built models that used a variety of other payment distributions and assumptions, but in all cases, the likelihood of an exact match remained low. For example, even when checking 15 large payments for any close match — which allows for over 32,000 possible combinations — only about 5 percent of payment sets contained a combination within $0.25 of $130,000. These results of both models strongly suggest that these five payments in late October are not a coincidence. As a result, we would contend that these payments deserve vastly more scrutiny from the press and, perhaps, from investigators. *Bayesian update: Several commentators have asked whether a more explicitly Bayesian approach would change these conclusions. We argue that it does not. See here for a note on our statement of the probabilities.